Ack, I think I made a mistake! I really love my new cabinets. I know they aren't for everyone but I'm super happy with them. How-so-ever I think the appliances don't look good with them. I really wish I had went with white appliances. I wanted to have white subway tiling but now I think instead of giving the kitchen a bit of breathing space from the cluttered patterning of the wood, it'll just make it more chaotic looking. Oh well, it's too late now. I'm just going to have to make the best of it. I'm just not sure how to marry the cabinets and appliances together. Any suggestions? 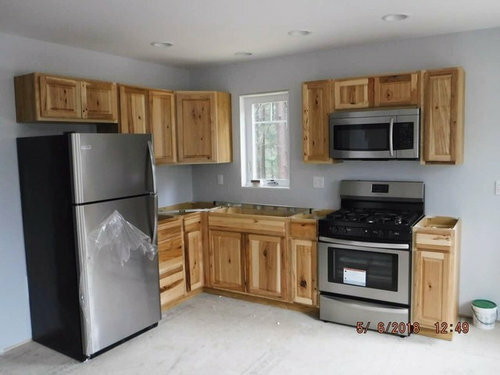 I was thinking maybe I should stain the cabinets gray. Oh and the floor still needs to be put in. As well as the countertops. I’m not one of the experts, but I want to say this type of wood is for me, I love the light natural look of wood grain, is it hickory? We have natural, unstained local birch with a lot of grain. I see stainless as neutral that goes with everything and I think it looks good. I know you’ll get great advice, good luck! I will follow along about backsplash advice if that’s ok since we are trying to decide and our wood /stainless combo is similar. Not an expert here, either, but I agree that stainless is a neutral. I’m wondering if the problem is your gray walls accentuating the stainless, rather than the warm wood tones. 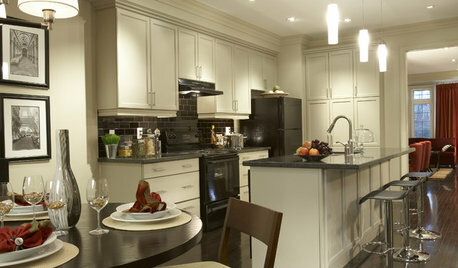 Maybe one of the color experts can recommend a paint color that would better complement your cabinets. Gray has been overdone ad nauseum, but is, mercifully, on the way out. White subway tile isn’t far behind. Maybe a good designer can help you complete your selections and get you the look you love. The easy fix, but there would still be money involved would be to replace the Kitchen Perimeter counter top. It appears that you have quality cabinets and appliances. I question why your designer would even consider a laminate top in a kitchen of that caliber. There are nice laminates, don't get me wrong. Keep the island counter top the same, for now. The backsplash is OK. Not stellar, but OK. That's why I suggest replacing the Kitchen Perimeter tops, that would be easier. Find something that goes with the tile. The other route would be to remove most of the glass tile. Leaving a 4-6&quot; deco line about 6-7 inches up. Then put a subway tile that compliments the Counter Top, in its place. Again.. I like them, they are modern, they look very nice! I love the grain and color. Like someone mentioned, do long stainless pulls. 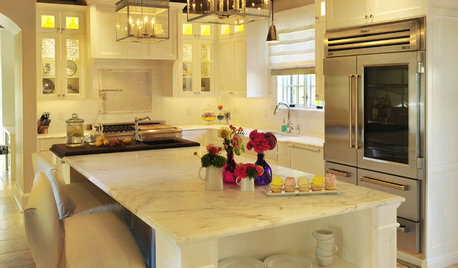 I'd use the same counter as the kitchen area, unless you want it to look a little different. But, they are close together, so, to me they need to be similar, to a point. Unless you want the bar to feel separate, then I think it needs to look intentionally different, like an accent piece. Maybe a stainless counter, and as I mentioned earlier, mirrored or stainless tile back splash, if going for the bar area to look different. Or you could always do the same counter as the kitchen and carry it up the wall for the back splash, or, do the same counter with the mirrored tile.That would look like an extension of the kitchen done that way. If you go with a stainless/mirror look, I think it would just look like a stand alone bar area. 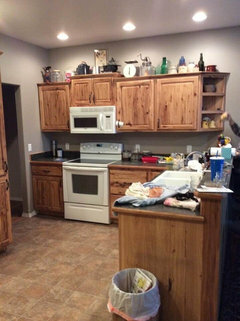 You mentioned CC was coming out to change out the cabinet fronts, to match up with kitchen grain? Have you asked if they have any with a glass front, for the tops? I think it will all look nice. You have an interesting start with a nice look! P. S. I like your back splash, is it black and white? no need to change it. I think you just need to figure out if you want the bar to look like an extension of the kitchen or it's own look, but still tying into kitchen. I do really love the natural look of the wood. It's knotty pine. When I saw it's many beautiful colors I knew I had to have it. It would be a shame to cover the natural colors up. Thanks for the encouragement :D.
Haha I hate beige and most nutrals in general. I find that gray is the only neutral I'm drawn to. But I'm totally open to a new color. I'm just not able to visualize what would be best. I'm feeling a lot more optimistic though. 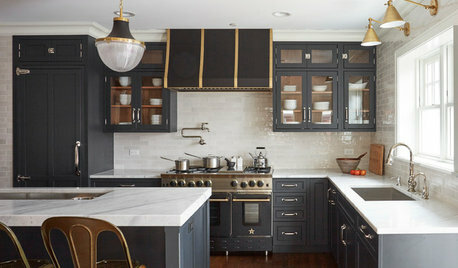 I would suggest just adding black hardware to the cabinetry to visually tie together the cabinetry and appliances. What a lovely kitchen. 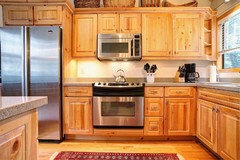 Nice job picking wood cabinets you love! Your appliances are neutral and look fine. You are not quite to the layer of picking wall color yet. Next is the counter and backsplash choices (these are entirely personal but I recommend something you love in a solid with a small pattern with little movement). Then cabinet hardware (stainless would be a choice to go with appliances) and floors. This kitchen has a simple patterned counter in a nice warm gray speckled pattern, enough to help it go with the appliances and the cabinets. I also think the problem is more your wall color. Cool grays and warm wood tones do not bring out the best in each other. The stainless appliances are fine. You don't even need to think about a backsplash till after your countertops go in. I have a cream subway tile with my wood cabinets and like it a lot. I do not have a contrasting grout - that would make it too busy in my kitchen. Cream subway will not work greet with the gray walls. Consider a sage green, green gray, or cream for the walls. My kitchen is not pine, but I do have wood cabinets - a vintage style. Pics in my "my pics" idea book. Trying to stain pine gray would likely come out poorly. Warm woods don't take gray stain well - has to be done by an expert and pine tends to stain blotchy. Don't mess with the pretty cabinets. They are not the problem. This is the kitchen in the house we just bought. We painted the walls valspar "smoked oyster" I love the color it is a warmer brownish gray that changes with different lighting. It really goes well with both our countertops and flooring that are laminate and linoleum, nothing expensive. wasn't crazy about the cabinets they would not have been my first choice but they really grew on me and living in Montana the rustic really fits. Having just bought the house we can't make major changes but the white appliances is something I do want to change. I have never liked white appliances and think stainless would look better but when we do change I really want to get the black stainless or slate. Another view of our kitchen please ignore the mess it was mid move and really was a mess. 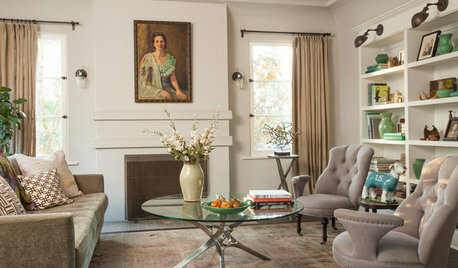 I also know it is not a favored look right now but we love antiques and they make a great backdrop. I don’t have better pictures to post right now. Our cabinets are knotty hickory. Now I'm not at my place in person yet but I told the builder that I wanted a warm gray. I said this looks cool gray to me but he insists it's a warm gray. So hopefully it actually is warm and that the pictures are just coming out cool toned. Thank you all for the wonderful suggestions. This is great! I'm so glad the problem isn't as big as I thought it was. 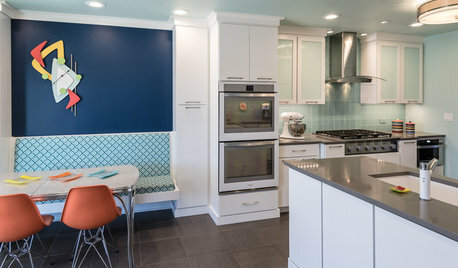 Wall color and backsplash are an easy fix. I can definitely change those if it doesn't work out. I'm also happy to hear that I don't have to stain the cabnits because I really like them the way they are. I really love that knotty hickory Cheryl! Yeah they really are great for that antique look. The kitchen is still unfinished, so once you add hardware, counters, and backsplash things will sort them selves out. I think maybe the fridge is a bit bulky and might be making you eye go straight too it. what about adding a storage cabinet to the left side of the fridge? could make a great pantry /storage space? could something be added there? Also that picture you posted is amazing Rawketgrl! I feel pretty relieved because the counter top that I picked is basically the same, just a tad darker and the flooring I picked is very similar, just a tad lighter. So I think everything is going to work out just fine. The pantry to the side of the fridge it a good idea RL! Again thank you so much for the lovely tips and for helping me to relax. I was definitely panicking haha. your fridge is meant to be have the sides hidden. i think white appliances would have looked Very Very Bad. i only like white with white cabinets. 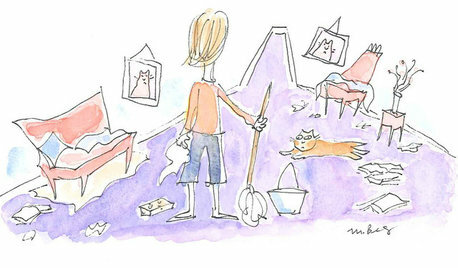 If you get everything finished and are still unhappy, you need the blame the wall color. 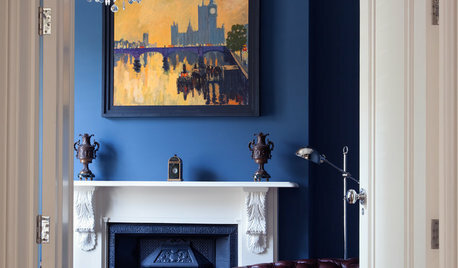 There are some greige colors with warm undertones but the color on your wall is not one of them. If the wall color had any bit of warmth the warm cabinets next to the wall color should have pulled the warm undertones out. It's not happening. 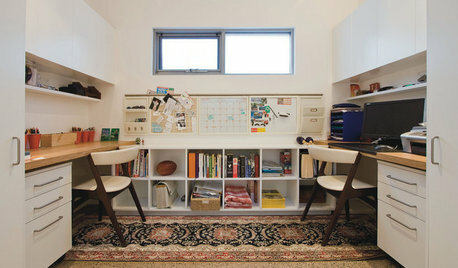 If you aren't open to changing the wall color you could make the warm and cool look intentional. Add a rug and art with gray and tan or some gray and tan accessories. Thanks D_gw! I'm open to having a different wall color. I actually asked for warm grey but it's definitely not looking warm gray that's for sure. I'm hoping it's just the picture. Like maybe there was a cool filter setting on when the picture was taken. I'll just have to wait and see when I get there in real life. But at least that's an easy fix. I'm glad that I was just panicking over basically nothing haha. Whew, I am relieved that the appliances I picked were good. It's the wall color, not the appliances. Try Clay Beige or Pewter Revere. This is the exact same kitchen that my parents have. Same cabinets & layout. 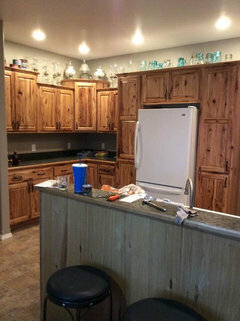 NIce cabinets and I agree with everyone else it is the wall color throwing you off. Get your counters and backsplash, then tackle the wall color. Nice choice of cabs! Zullala, make sure you find out if you can get a cabinet for the left side of the fridge as it will be really a game changer, and also it will look a lot more complete. costs a lot less than you might think and are easy to install. If you cannot get a cabinet to complete the looks stainless wall unit to fill in the gap. What are your materials for flooring, counters and backsplash? Stainless for the rustic wood looks good so far. All the details bring it together. Lighting will help as well. Totally agree with the cabinet wall for the fridge. The black side of the fridge also immediately pulled my eye to it. Don't fret about not getting white appliances. What you have is much better. You can't stain the cabinets; they already have a finish on them. I wouldn't go for white appliances and I think you made the right choice with the stainless look. To create balance, go with stainless hardware on your cabinets and choose a warm color for countertops and backsplash. For example, I think Haze Caesarstone that is creamy and beige stone would look lovely in your kitchen along with Arabesque tile or Botticino Fiorito tile backsplash. Just to add to the echo chamber - the appliances are fine. They are neutral and work with your cabinets just fine. The issue is the paint, or at least how the paint is appearing in photos. It does not highlight the warmth of the cabinets and is instead competing with them. It looks more a cool gray than a warm one. You don’t need to go beige, but you do need to go warmer. Maybe even a light sage. Depending on the backsplash you go with I’d also consider a much lighter paint - a warmer white (can still be neutral and not “yellow”) - which might lighten things nicely. Like the cabinetry too! What have you picked for faucet? 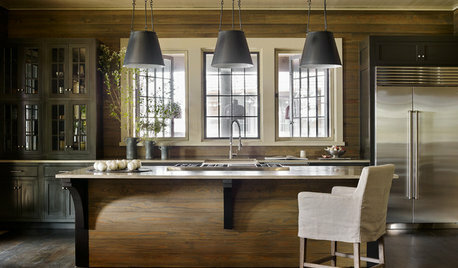 BOLD COLORNew This Week: How Dark Can Your Kitchen Go? Best 36 inch induction cooktop for 2017/2018? Classic™ - Copper Range Hood - Wall Mount Kitchen Vent, 48" X 30"
Baltimore™ - Copper Range Hood - Wall Mount 30" x 22" x 27"
Ironworker™ - Stainless Steel Range Hood - Wall Mount 30"
Classic™ - Copper Range Hood - Wall Mount 36" x 22" x 36"